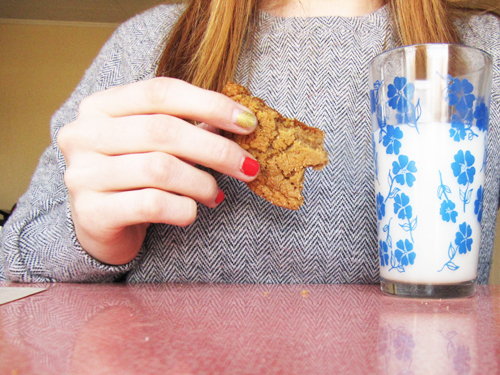 These cookies are bringing wrinkles back. Good thing, because I rarely iron. Even when I’m wrinkly. I just decide to believe it when Jake tells me that my outfit looks like “it’s supposed to be like that.” But “like that” means wrinkled. Ever since I made those large marge cookies, I’ve just been thinking that bigger cookies are better. I mean, if the cookie’s bigger than there’s more chewy center to love, right? 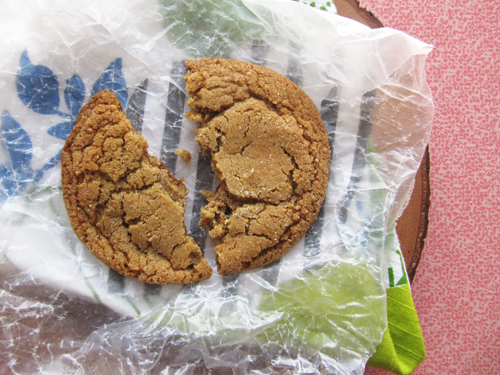 Cookie middles are my favorite. 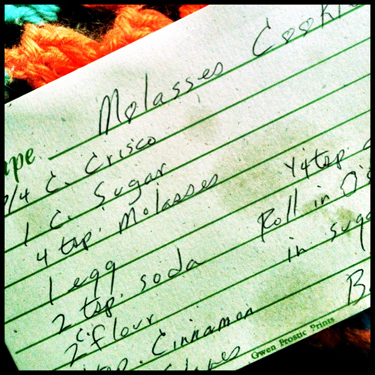 When I told my mom I made her molasses cookies she told me it was actually her mom’s recipe! So my mom ate these as a kid and so did I. That’s a fun thought. And my grandma knows whats up. These are perfectly chewy and spiced like fall. Jake loves them too. These taste like high-fiving fall-time. * I used butter instead of crisco and I put a hefty pinch of salt. Preheat your oven to 350ºF and line two cookies sheets with parchment paper. Cream together the butter with 1 cup of sugar. Beat for 1 minute. Add the rest of the ingredients and mix until combined. Place remaining 1/4 cup sugar in a small bowl. Using an ice cream scoop or a large spoon scoop mounds of dough and form into a ball about the size of a golf ball. Roll through sugar. Place on prepared baking sheets leaving a couple inches of space between each. Bake for 15 minutes. Allow to cool on the baking sheet for 2 minutes before transferring to a wire rack to cool completely. My mom makes her o’s into hearts. Jeez, I just love her! Oh, man. Molasses cookies are my favorite. The chewiness. So delightful. These might be on my to-make list this week. Yeah man! You totally should. We just ran out yesterday and I totally miss them already. 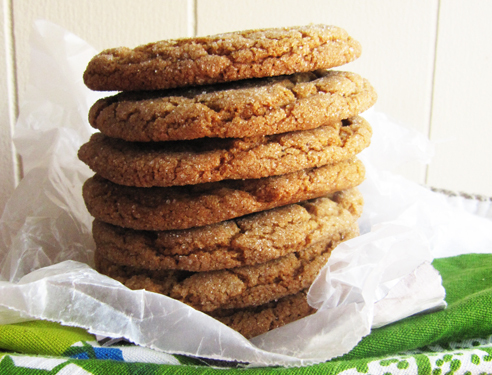 I just got this recipe out and leaned it against the cookie jar…anticipating making them tomorrow!! 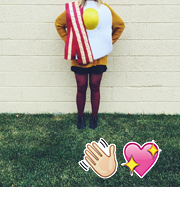 I did wonder if you used all butter..I may do that too <3 . Cool Mum! And I say go for the all butter for realz! Love the chew in cookies too! These look really good! 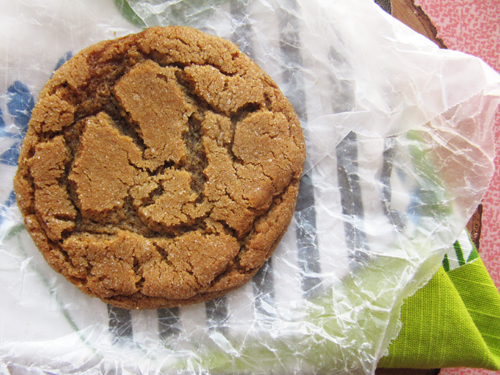 I love molasses spice cookies! In high school I had a friend that would make them for me, that was during my pre-baking days…the lesson is, cookies make friends. I love that this recipe is an heirloom! Kangli – ooh me too! Thanks! Cindy – Yeah man. Molasses is where it’s at. And you’re so right! 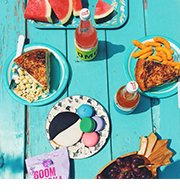 Cookie sharing is totally the way to make friends. I like that you said they were bringing wrinkles back 🙂 So yummy! Nicole: Thanks man! I bet you’d love these guys. These cookies look lovely! I’ve always been a friend of crinkly wrinkly cookies. How rad that both you AND your mom ate these as kids. My grandma passed down NOTHIN, except her love for licorice and M&M’s, I can confidently say I inherited that from her! There’s a bakery near us that makes cookies that look like this, and for years I’ve wanted to try and recreate them!!!! Can’t wait to try your grandma’s recipe!